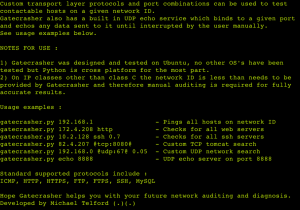 Browse: Home / Gatecrasher – Network auditing and analysis tool. Gatecrasher can be thought of as a subnet broadcast tool which records contactable host addresses and displays them to the user. Different protocols and ports can be used to contact potential hosts. 3 user arguments can be provided but only 1 is needed. The full 3 args consist of a network ID string, a protocol or service string, and lastly a timeout integer or floating point integer for connections and replies depending on the nature of the selected service. Only the network ID is needed meaning the protocol and timeout are taken as the default values set by the script which is the ‘ICMP’ (ping) protocol and 0.25 second timeout to listen for replies if not provided as arguments. reater timeouts may be needed on WAN’s for accurate results. Custom transport layer protocols and port combinations can be used to test contactable hosts on a given network ID. 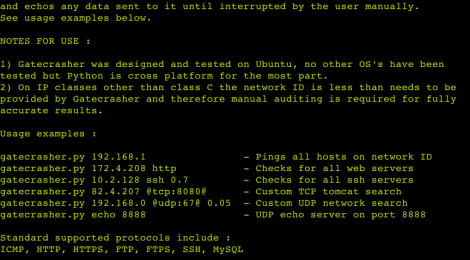 Gatecrasher also has a built in UDP echo service which binds to a given port and echos any data sent to it until interrupted by the user manually. ← wpscan v3 beta – is a black box WordPress vulnerability scanner.